Hoosiers: The Story of Indiana... Ligonier is featured! Several months ago I was interviewed by WFYI in Indianapolis to speak about the historic cultural diversity in Ligonier. The four-part documentary, Hoosiers: The Story of Indiana, aired on the PBS station in July and August and is now online. I'm not sure for how long though. If you’re short on time, just watch minute 47:00 to minute 53:00. These six minutes feature Ligonier and the historic synagogue as well as the vibrant Latino community the town boasts today. What a great time to move back to Indiana. My husband, daughter (a few days shy of 18 months), and I moved to Northeast Indiana just a few weeks ago. I haven't lived in the State since 2000 when I graduated from Indiana University in Bloomington. Initially I thought coming back would be a bit of culture shock, but everything is just as I left it. My dissertation is a few revisions away from being done (defense May 24) and it's great to be nearer to family and enjoy all the comforts of home. 2016 is momentous for other reasons, it's Indiana's bicentennial. I was asked to participate in the four-part PBS documentary celebrating the bicentennial only a few days after we moved. The film crew asked me questions about Ligonier's Jewish history, what lessons we could learn about its diverse past, and what makes me a Hoosier. Needless to say, the first two questions were much easier to answer. We'll see what makes the final cut, or if I even make it in the documentary at all. When I was back in Ligonier I saw a few things that disturbed me. First, Creps' bakery closed. Creps' was home to the cream center doughnut and I have fond memories of Dan Replogle bringing these to our all-day cataloging work sessions. Bye bye Creps', you will be missed-especially by my daughter who never even had the chance to taste a cream center. Shall we hope you may reopen someday? Second, I saw the "For Sale" sign outside Ahavath Sholom and what's more, after a recent storm, several asphalt shingles strew around the yard. My heart aches for this building as it sits waiting for a new owner. The community loves this "gem of Ligonier" and we all want to see it with a rightful caretaker and a new roof. As I unpack boxes in my new house, I wonder... just who will unpack theirs at Ahavath Sholom? Will it be this year or next? Will it be a family or a business? Will it be locals or out-of-towners? It seems to risky to leave up to chance. Indiana Economic Digest regarding the sale. This past fall I neglected my usual posting duties because I've been head over heels in love with my new baby girl. Eleora Margalit was born on October 17th and she's taken over the world as I knew it. She is named after her four great-grandmothers: Leona, Lenore, Eleanor, and Margaret (all in blessed memory). In Hebrew, her name means "Light of God" and "Pearl." But as I changed diapers and watched this bundle of joy double in size in her first three months, the historic 1889 Ahavath Sholom synagogue is now for sale. 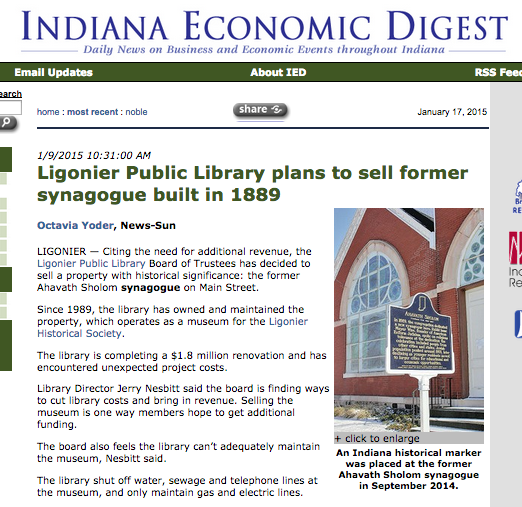 This news was not a shock to the Ligonier Historical Society. Before the Indiana Historic Marker dedication, Jerry Nesbitt of the Ligonier Public Library, told the group that due to the Library's recent renovations, they were operating in a deficit. Looking to liquidate any assets to minimize this deficit, the Library Board was considering selling Ahavath Sholom. Jerry has been a long-time advocate for the building not to mention an avid historian himself. At first Jerry asked me if I might have any ideas of individuals or organizations who may be interested in purchasing it. My initial thoughts went out to Indiana's Jewish community. Perhaps if we joined forces we could come together, like we did for the historic marker, to ensure the building stays as is, or better yet, restored. Then I had a baby and my volunteer efforts in Ligonier took a back seat for a few months. 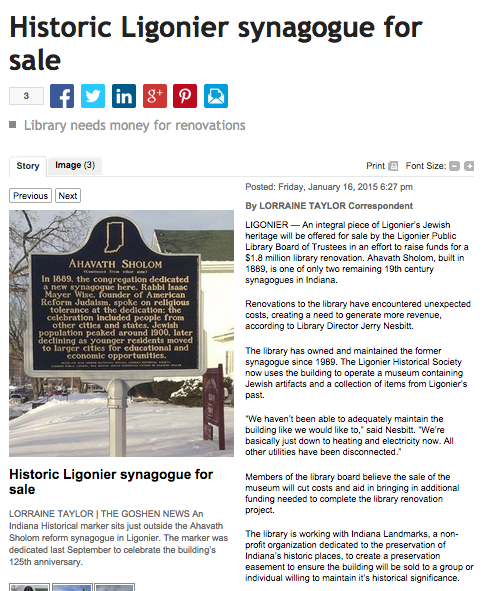 But over the past two weeks, local Indiana media published several articles regarding the pending sale of the synagogue. These articles have caused a flurry of phone calls, emails, and letters (yes, actual paper letters) about the building and have reminded me that I need to reach out to the Indiana, and maybe even the Midwest, Jewish community to make sure they are aware that this beautiful building is for sale. The Ligonier Historical Society is taking a hiatus in collection organization and stabilization this winter. Once the new owner of the building is identified, the collections may need to be relocated but this is still unclear. As new, concrete information surfaces, I will be sure to post it here. In other news, thanks to the hard work of Sheryl Prentice, the Noble County Visitors Bureau was selected to participate in a "Bicentennial 2016: The Next Indiana" workshop to help promote Ligonier's historic Jewish heritage to tourists. The kickoff meeting is this Friday the 23rd and I am excited to hear what comes about from the planning! This past labor day, about 75-100 people gathered at Ahavath Sholom to dedicate an Indiana Historical marker. This marker was the result of almost two years of fundraising, researching, and writing and it was all worth it. 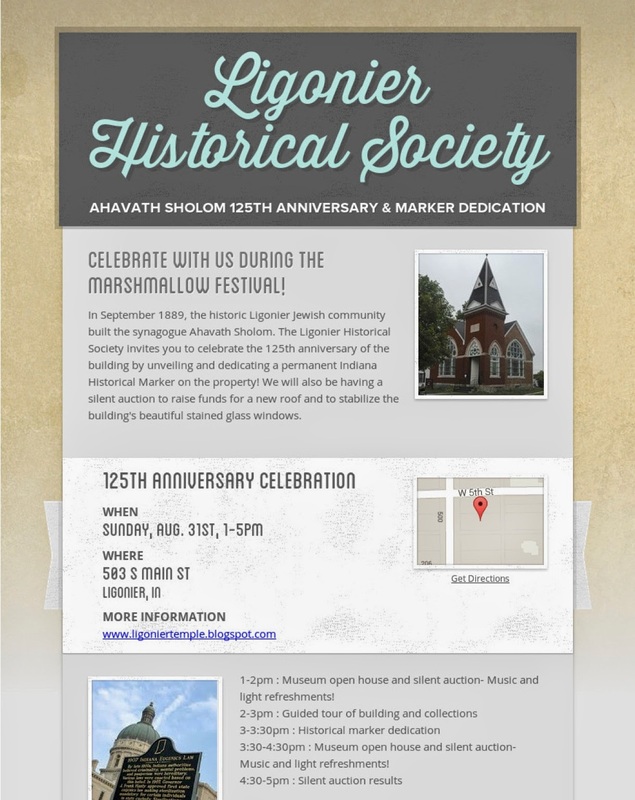 The Ligonier Historical Society got a 125th birthday cake for the 1889 Ahavath Sholom synagogue building, we had a silent auction and period liturgical music playing in the background, and yours truly gave an architectural building tour! While it was swelteringly hot, the mayor of Ligonier came to celebrate with us as we dedicated the marker and read a poem that was read during the dedication of the building, 125 years ago. Below is the text of the marker that is cast aluminum, powder-coated blue with gold-lettering. Ligonier’s Jewish residents formed the congregation Ahavath Sholom (Hebrew for “peace loving”) and circa 1867, built a small synagogue nearby. The congregation formed close relationships with local churches. The Jewish community prospered, providing civic and business leaders. In 1889, the congregation dedicated a new synagogue here. Rabbi Isaac Mayer Wise, founder of American Reform Judaism, spoke on religious tolerance at the dedication; the celebration included people from other cities and states. Jewish population peaked around 1900, later declining as younger residents moved to larger cities for educational and economic opportunities. Installed 2014 Indiana Historical Bureau, Ligonier Historical Society, Ligonier Public Library, and Indiana Jewish Federation Friends of Ahavath Sholom. If there had been more space on the sign, we would have loved to individually list the names of our generous donors whose excitement and monetary contributions made the marker possible: the Jewish Federation of Northwest Indiana; the Jewish Federation of Fort Wayne; the Jewish Federation of Greater Indianapolis; the Jewish Federation of St. Joseph Valley in South Bend; and the Michiana Jewish Historical Society. It's all happening so fast! There is so much happening at Ahavas Sholom this month that I have to share with you my excitement! First, the Ligonier Historical Society (LHS) has finished cataloging all the 3D objects and 2D paper items in the collection. This process has taken two years and would not have been possible without the help of all the LHS member-volunteers. Once our catalogs and finding guide are finalized this fall, I will be posting them to the blog so researchers, Ligonier community members, and anyone who is interested can dig around and discover what's available at the LHS. Archival boxes hold hundreds of years of Ligonier paper items. Post-it notes will be replaced this week with permanent box labels. 3D items were placed in waterproof tubs and inventoried for lower level storage. Archival silica packets placed inside the tubs wick away any additional moisture. Items too big for the tubs will be stored on the main level. 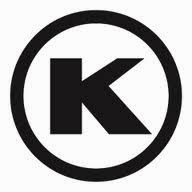 Secondly, last year, we applied for an Indiana Historic Marker. The application process was quite competitive and there were three long steps involved. The cost of the marker is $2,050 and all four Jewish Federations and the Michiana Jewish Historical society have pledged funds to make up the balance of the marker and I am taking care of all the administrative tasks as a volunteer. The Ligonier Historical Society will host the dedication celebration festivities in early-mid September. More updates on this to come later this month! I truly believe that State recognition (the building is already on the National Register for Historic Places) will help us not only to secure future funding, but also to insure the building is maintained and appreciated for years to come. Learn all about Indiana's historic marker program by clicking here! Finally, the LHS/1889 Ahavas Sholom Temple building will be open for visitors by the end of the month. The summer exhibit celebrating the 125th anniversary of the temple will take visitors back in time to what Ligonier looked like in the 1880s and 1890s. Stay tuned for a "Visitors" tab to include opening dates, times, and contact information! Record workshop day and a very sweet visitor! Thanks to Jeana, Everett, Dan, Jed, Ann, and Angie, we were able to get a lot accomplished at Ahavas Sholom this past Saturday! This time we divided into teams and worked on three organizing/archival projects. First, Dan, Ann, and Jeana worked to organize "Ligonier Schools 005" collection. They organized this collection into five archival boxes. A lot of the material in this collection is oversized and we still have these oversized items yet to organize next time. Second, Jed and I worked on compiling the Historical Society's finding guide. As Jed brought each of the 49 boxes my way, we gave the box a title and recorded each folder's name. Now we are able to see the bulk of the holdings of the Historical Society as well as search by key word! As we add more information to this document, it will only become more and more useful to anyone and everyone interested in Ligonier's history. Third, Jeana and Angie worked to organize the administrative materials of the Historical Society. While sorting through educational materials, guides, receipts, donation papers, and other items related to the Historical Society, Jeana and Angie also found many archival documents that were later interfiled into our five archival categories and 49 boxes. The Kidd Marshmallow mural in Ligonier. At around 2pm, we had a very sweet visitor to our workshop: Chris Kidd, of the former Kidd Marshmallow Company. Kidd Marshmallow Company was Ligonier staple for three generations before it recently closed. A few months ago, I received an inquiry from a filmmaker interested in making a film about American confection-making. He wanted photos and video footage of the Kidd Marshmallow Factory and Everett knew Chris would be the one to ask! Chris was nice enough to bring two videos and several photographs of Kidd Marshmallow when it was in operation. He also donated several other items of significance to the Historical Society. Before he left, I asked Chris how Kidd's made kosher marshmallows and he gave me the whole scoop! Twice a year (or so) Kidd's would close down normal operations and a Circle K rabbi would come to observe the cleaning of the equipment (of course the equipment was cleaned constantly, but twice a year a rabbi watched in order to certify the marshmallows as kosher). Then, the recipe was altered to substitute the regular gelatin with kosher beef gelatin. Chris told us a funny story about the testing that was involved for the kosher marshmallows and how they attempted to use a vegetable cellulose to make "pareve" (not meat or dairy) marshmallows. Disaster ensued as a tan-colored slime emerged! This was far from the delicious powdery-white fluffy marshmallows we all grew up with as.... Kidds. Two entrepreneurial Jews from Germany came to Ligonier, Indiana in the 1850s and by trusting their neighbors, they co-existed peacefully in a diverse community. Today, the synagogue (Ahavath Sholom, Hebrew meaning "Peace Loving") built in 1889 is listed on the National Registry of Historic Places- a tangible symbol of a small town’s successful effort to embrace the demographic diversity that now confronts similar communities across America. Currently pursuing my Ph.D. in American Jewish History at the Ohio State University, my dissertation is on the Jewish involvement in desegregated higher education in the South. In my spare time, I love to help out at Ahavath Sholom in any way I can.